A former Roding Valley High School student has received Loughton Town Council's Young Citizen of the Year award. 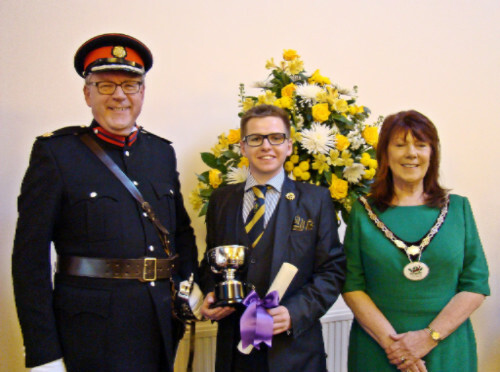 Adam Taylor, who was a pupil at the Alderton Hill school for five years - from 2006 to 2011 - received the award from Deputy Lieutenant of Essex Michael Chapman during the council's civic service which was held at Loughton Methodist Church on Sunday (February 28). Roding valley High School teacher Stephen Murray said: "As a school we are absolutely delighted that Adam has received this richly deserved award. "Adam was a first class pupil working hard, helping others and making a massive contribution to the school community. It is very pleasing that he has continued to display these traits." Adam was nominated for his exceptional service to young people and his commitment to the Scout Association of which he has been an active member since he was four. Now 21, he has become the youngest adult leader to complete training in over a decade within the district. He is on the 1st Chigwell and Chigwell Row Scout Group Executive Committee and the District Executive Committee - the only person aged under 25 to hold the roles. He has completed a range of fundraising projects from bag packing to marathons, raising over Â£15,000 within the past five years. As a Duke of Edinburgh Team Leader he mentors young people through the award levels and as a Queenâ€™s Scout has been involved in a number of national scouting events including the St George's Day Parade at Windsor Castle and the Remembrance service at the Cenotaph. Away from his scouting commitments, Adam still finds time to volunteer with the Crostyx Hockey Club. worked in difficult and dangerous conditions during the Second World War, including his grandmother Ellen Taylor. District Commissioner Peter Fairweather said: â€œAdam is a credit to his scout group, the Royal Forest Scout District and to his family."